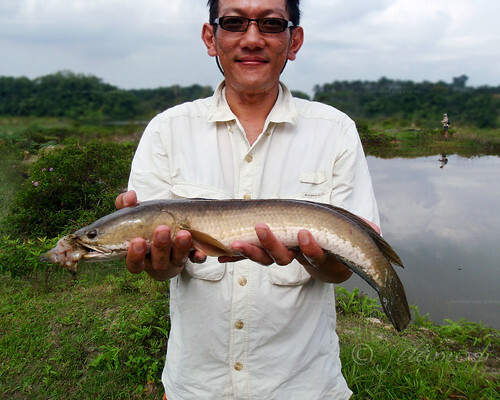 LURE FISHING for Striped Snakehead (haruan, c. striata) can be very addictive. Not to mention challenging and frustrating at times. 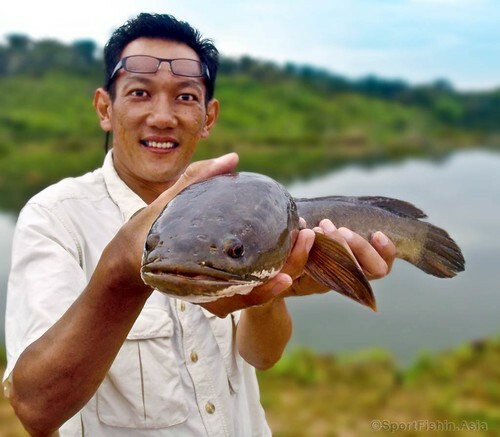 Compared to fishing for its big brother the Toman (Giant Snakehead), Haruan fishing is almost finesse. Over the past one year or so, I’ve had the distinct privilege of comparing fishing for snakeheads using artificial baits (lures) versus natural baits, or more specifically frogs which happens to be the de-facto bait for as long as time. We all know many asian anglers swear by their frogs to catch haruans. Many in fact, will not even go haruan fishing if they are unable to obtain their froggy supply of bait. This fish almost totally engulfed the 9 cm Ofmer lure, head first. Does natural bait out-fish the artificial bait? The result from my observation at least is far from that. While we cannot argue the effectiveness of natural bait, time and again the plastic or metal variety has actually yielded better results than going natural. And it sure is hell a lot more fun catching snakeheads on lures. 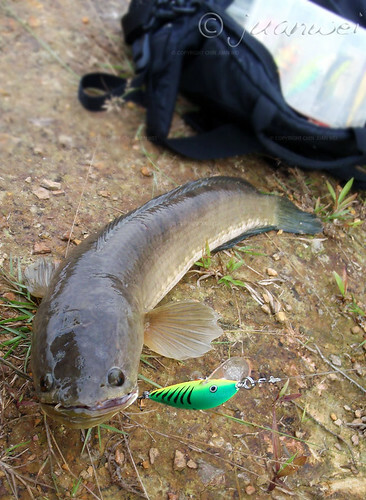 Allow me to quote a friend, Alan, who recently caught his first snakehead on lure “…it was really hard work with lure but the hookup was definitely exciting and very different. The strike was very violent as well, in my case anyway”. [Update: Within less than a year since that first bite, Alan is totally hooked on lure fishing! And have even lost count of the numerous fish he has landed since]. As a matter of fact, 3 long-time frog-loyal anglers went snakehead fishing during a recent festive break. There was no supply of frog bait due to the holidays so they had to rely solely on lures (perhaps encouraged by my catch results?). And they still managed to catch, and release, 5 snakeheads between them in a decently brief 4 hours of fishing. Not too shabby! Still it never fails to amaze a die-hard frog angler when he sees a big snakehead clinging on to a bait so unnatural looking it seem crazy that a snakehead would bite them at all. Let alone the bigger and supposedly wiser fish. Don’t worry. No haruan is smarter than a fifth grader. While many lures have come a long way in terms of resemblance to their natural counterparts, it’s only natural to wonder why fish bite noisy pieces of metals or plastics. The subject here is not to give the Channa family too much credit. They’ve got brains the size of your thumbnail and can’t rationalize things like we do. Proof of this lies in the fact that many of us have caught snakeheads using artificials made out of rubbers, metals, plastics and the likes. There are many factors that influence haruan feeding behaviour, and so each and every day presents a set of new challenges as no two days are alike. 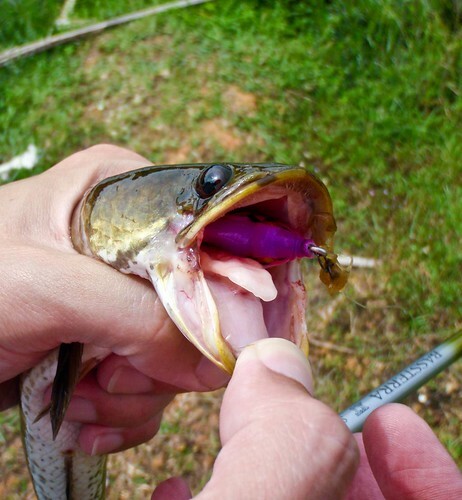 This Snakehead has a liking for the pink Mazzy Frog. 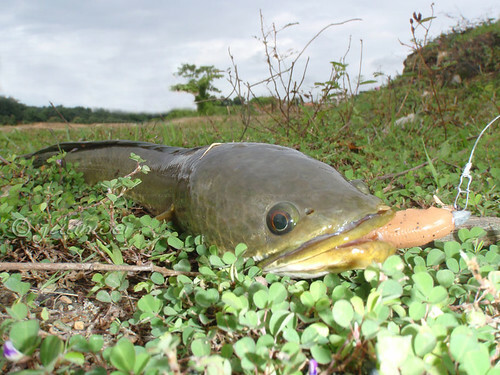 Adult snakehead is an apex predator; generally they are not open water hunters but rather ambush artists, which means that they usually hide in wait and then “pounce” on their prey. Snakeheads will strike on prey up to 2/3 of their own size. Countless Striped Snakeheads have been taken on Spinnerbaits. While smell and vibration plays a role in attracting their attention, snakehead rely heavily on their sight to locate prey. And though it makes sense to have a lure that looks as close to the real thing as possible it is not as important as you might think. There are other factors such as water clarity and the other is the snakehead’s tiny brain. Especially in stained water, size, shape and colour are secondary to placement. This means if the fins on your bait are out of place or simply finless, how many scales or legs your bait has aren’t as important as where you place your cast. If it’s there and easy, it’ll most likely get eaten regardless of what it looks like. Snakehead also rely heavily on instinct, which leads them to strike at things they normally wouldn’t if they could mull it over before deciding whether or not to strike. They see churning on the surface, assuming it is a struggling something or other, and attack. The question of colour, shape or smell arises later. The saying a lure’s colour catches an angler first hold some truth to it. 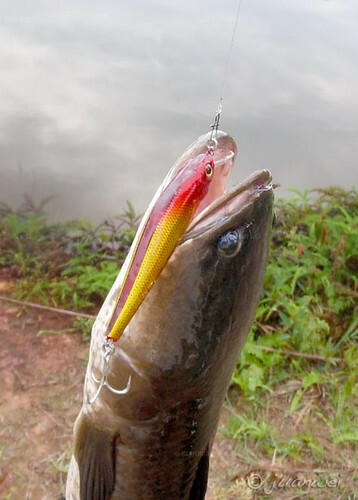 If you drag a bait in front of a snakehead’s nose, it sees an easy meal swimming past. It will eat it whether it’s a natural colour or not. Most animals behave in a similar manner; they instinctive know some things without ever having to learn them because it is already pre-programmed in their DNA. This Striped Snakehead was taken with a Rapala Countdown. 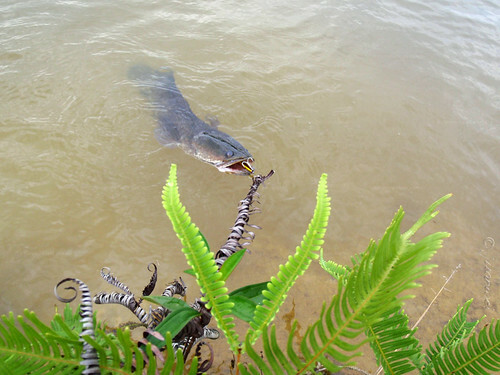 The Striped snakehead regurgitates its last meal, a Gourami (Ikan Sepat) shortly after. When you stop to think about it, lots of lures are meant to imitate fish’s favourite forage, but then there are things like spinnerbaits. 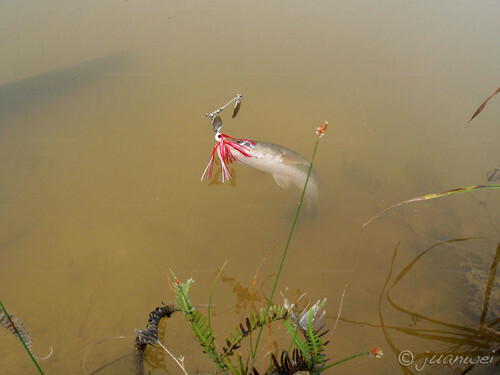 What does a spinnerbait imitate? And how about baits with little propellers attached either in front or at the tail section of the lure? So why do snakehead eat anything like these? Quite simply because snakehead are very instinctual much like other predatory fish, they’re pre-programmed to eat first and ask questions later. If something looks like it may be a good meal, they take a bite at it without further thought. Snakehead lacks the capability to rationalize things like we humans do. They don’t stop and think about what could be making that commotion nearby. Even though it may attract them to check it out they simply see it as an opportunity for a meal and strike it. I have observed that most snakeheads caught on lure are hooked onto the front set of hooks. This in my opinion indicates feeding behavior as they intend to swallow the bait headfirst. This also shows the haruan striking quickly as the bait swims past either in front of them or above them. To summarize, snakehead are not as smart as we’d like to believe, and they’re even less discerning. If something is there for the taking, more often than not it will get eaten. But remember the basic rules, try to match natural tones and patterns in clear water and use anything you can in stained water to get the attention the lure deserves. Lure placement trumps all in the end. Snakeheads also dig soft plastics. In this case a scented Berkley Gulp! Shad rigged on a Nitro jighead. Some of the lures you can find in my tackle boxes when I go snakehead fishing. Conserve fish population. Remember to always practice catch & release whenever possible.